Celebrating Singapore Shores! : Mudskippers - Masters of the Mudflats! Mudskippers - Masters of the Mudflats! Rude, but definitely cute. The mudskipper can swim, skip, walk, climb and some can even dance. 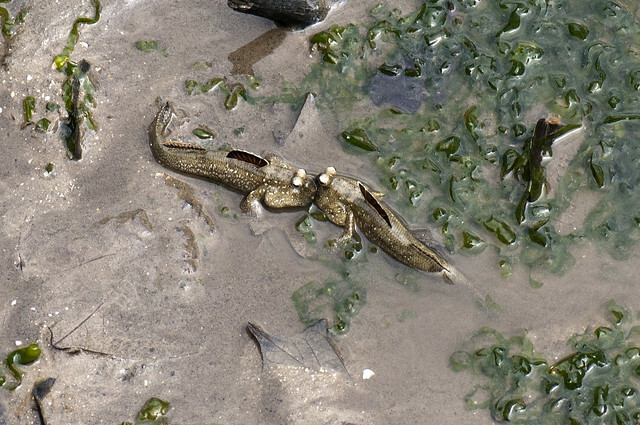 During low tide, mudskippers are among the few marine creatures that can exploit Singapore's mudflats. Their amusing antics are a delight to observe. Is it a fish, a frog or a snake? Being happy both in the water and on land, some people may think it is an amphibian like frogs, or a reptile like snakes. But a mudskipper is a fish! How does it breathe out of water? Just as divers breathe underwater through tanks of air, the mudskipper carries 'tanks of water' in its gill chambers. These chambers are enlarged which give the fish its cute puffy-faced look. Other mudskipper features that enables it to rule the mud include large eyes at the top of the head. 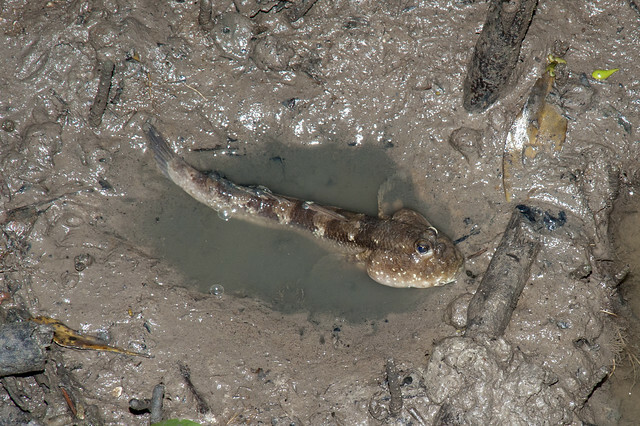 For an all-round view - it's hard to sneak up on a mudskipper. While the mouth faces downwards to feed on the mud surface. Just as air tanks give divers only limited breathing time underwater, the mudskipper also has to go back to the water to refresh the 'tank of water' in its gills. The fish can also breathe air through its wet skin. 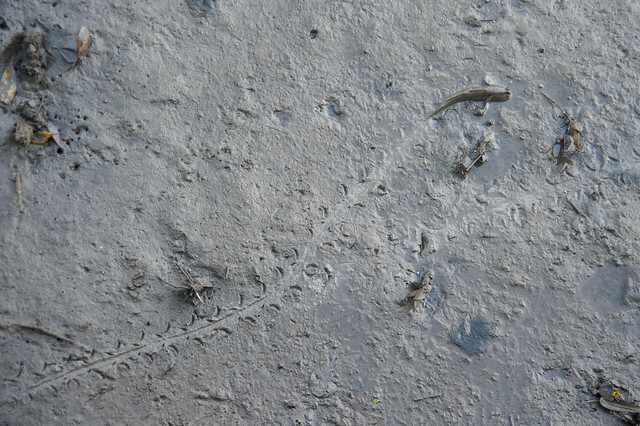 Mudskippers 'walk' on mud using their pectoral fins (on the side of the body) like crutches to crawl slowly and steadily. Leaving a typical trail in the mud. They can also jump a distance by curling their muscular body sideways then pushing against the mud to spring forward. 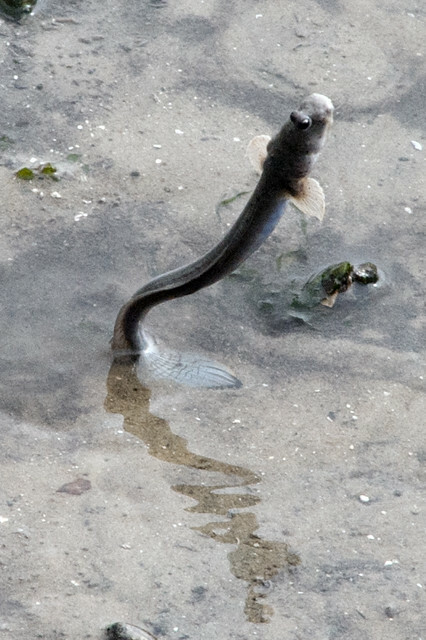 The slender Bearded mudskipper can even 'stand' on its tail, if only for a brief moment. The male does this repeatedly, and thus appears to 'dance'. Of course, this performance is to mainly to impress the ladies. 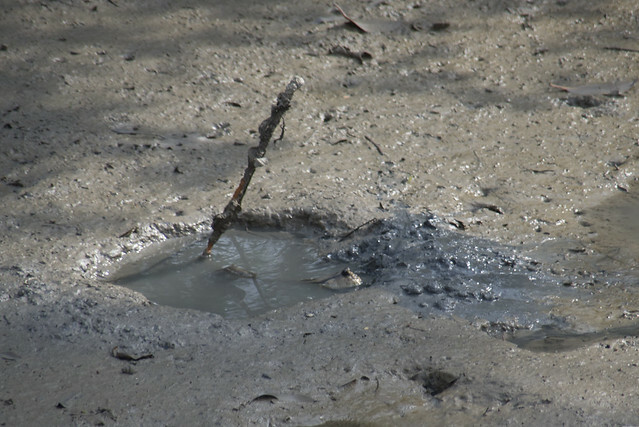 Some mudskippers can laboriously dig out a large 'swimming pool'. One mouthful of mud at a time, the fish creates a pool that is deep, ringed with an edge, leading to underground burrows where eggs are laid and baby mudskippers can emerge in safety. Spitting out a mouthful of mud. that the mudskipper had just spat out. Mudskippers often use their dorsal fin (at the top of the body) to speak to one another. 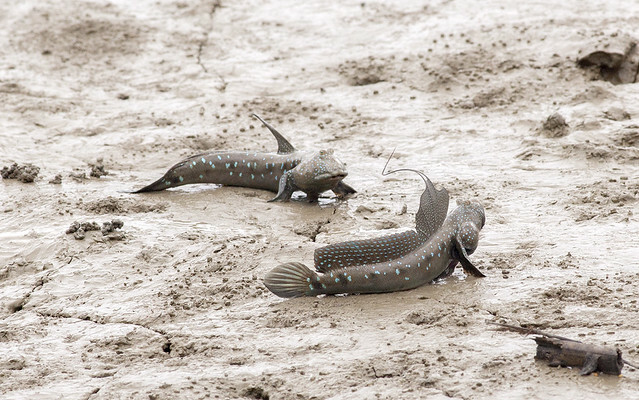 Furiously flicking the fin up and down, the mudskippers seem to be shouting and giving each other The Fin! The tall slender fin of a Bearded mudskipper. The dorsal fin when raised can be quite amusing: colourful, large, oddly shaped. Boldly patterned fin of Gold-spotted mudskippers. Spectacular fins of Blue-spotted mudskippers. Mudskippers can be quite quarrelsome! Yellow-spotted mudskipper eye-to-eye and fin up! 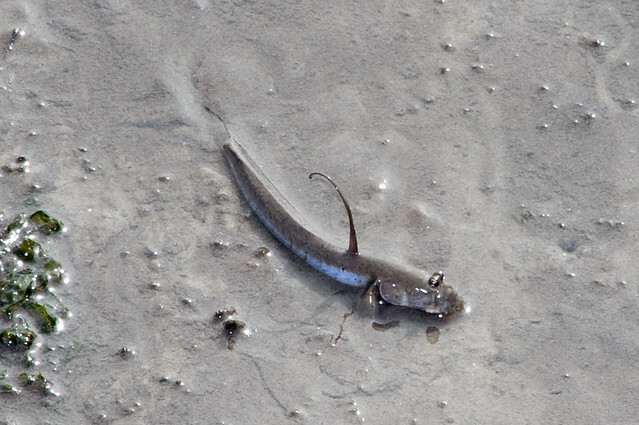 Being able to skip around on dry land gives the mudskipper an advantage over 'normal' fishes at low tide. But the mudskipper is not a strong swimmer. 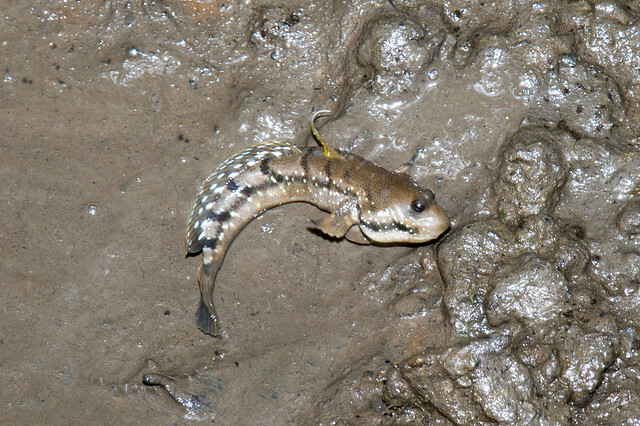 When aquatic predators swarm in with the rising tide, the mudskipper can get out of the water. In some mudskippers, the pelvic fins (under the body) are fused to form a sucker so they can better cling to rocks and mangrove tree roots. Usually just a little above the water line. They don't really climb very high up. 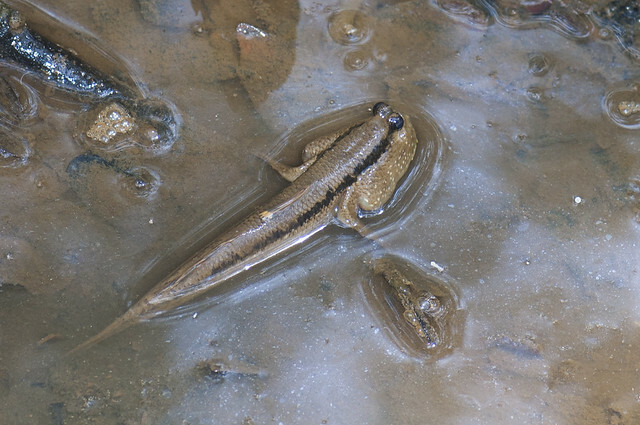 Which is our Biggest and Baddest mudskipper? 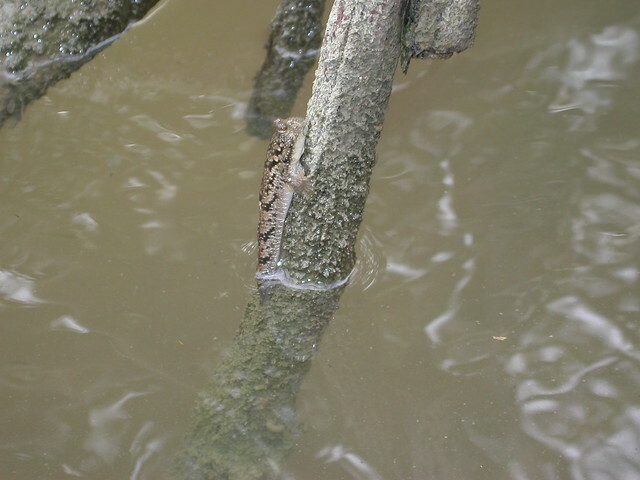 The Giant mudskipper is Singapore's largest mudskipper. It can grow to the size of your foot, nearly 30cm long. It has a bold dark stripe along the body length. An aggressive hunter, it eats mainly prawns, small crabs like fiddler crabs, and insects. It may even snack on smaller mudskippers! 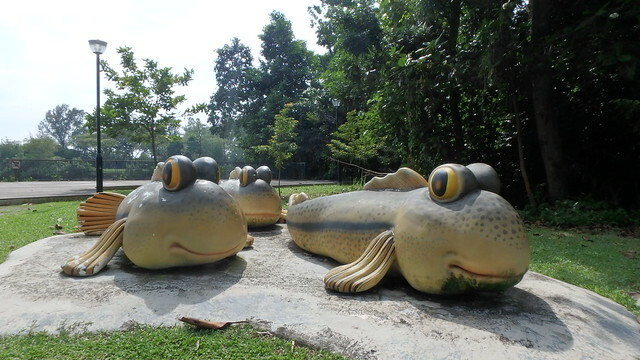 Singapore has many kinds of mudskippers. Some are small and hard to spot. Where can we see mudskippers in Singapore? The Chek Jawa boardwalk is a great place to spot many different mudskippers. From the Mangrove Boardwalk, in the back mangroves, you can spot young Giant mudskippers and perhaps even the pretty Blue-spotted mudskipper. From the Coastal Boardwalk, in front of the mangroves facing the sea, you can spot a variety of mudskippers including the Gold-spotted mudskippers, which tend to travel in groups along the water line. 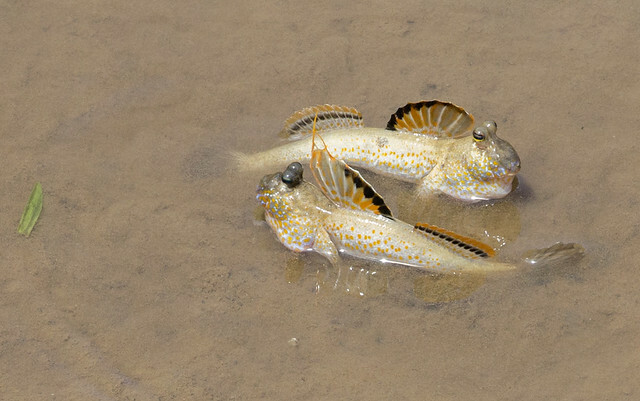 Dancing Bearded mudskippers and Yellow-spotted mudskippers are also seen here at low tide. 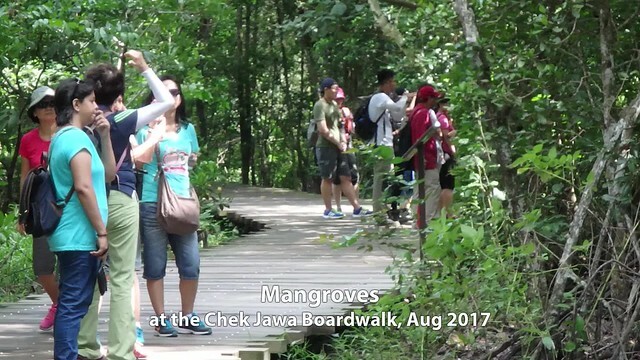 The Chek Jawa boardwalk is open every day 8.30am to 6pm. 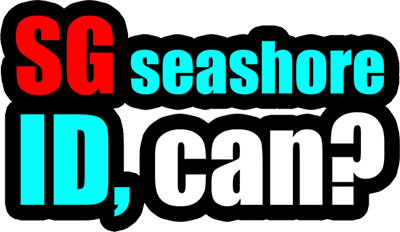 You don't need a permit or a guide to visit! More details on wildsingapore and NParks. 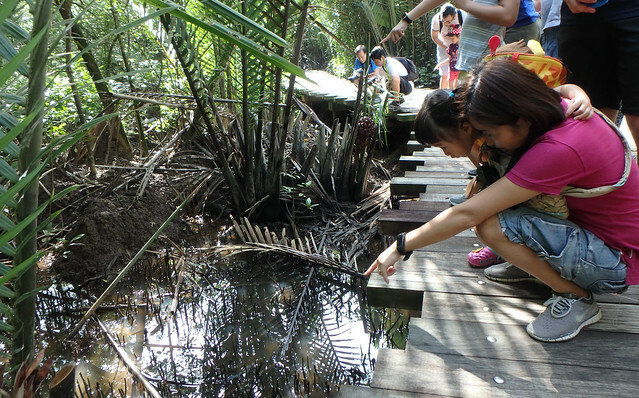 The Pasir Ris Park mangrove boardwalk is a great place to spot Giant mudskippers. They are everywhere. Since the boardwalk is open 24/7, it is also a great way to see these mudskippers at night. Some Giant mudskippers put on 'pajamas' with a barred body pattern, instead of the usual bold single stripe during the daytime. Giant mudskipper in his 'pajamas'. Sungei Buloh Wetland Reserve is also a great place to spot mudskippers of all kinds. There are even these enormous mudskippers for kids to play with and for that perfect mudskipper selfie! Join the free guided walks every Saturday at the Reserve, as well as many other exciting nature happenings there. More details by NParks. More about mudskippers from wildsingapore. Share YOUR sightings of mudskippers on Singapore shores. We would love to hear about it!